When soluble salts are present in huge quantities in the bricks or in the mortar, they absorb moisture from air or during construction progress and are brought to the surface in solution and deposited in concentrated patches either in the form of white powder, stains or as translucent crystals, as the moisture eventually dries out. The appearance of these crystals either flakes off or it is reduced to powdery form that can be easily brushed off. 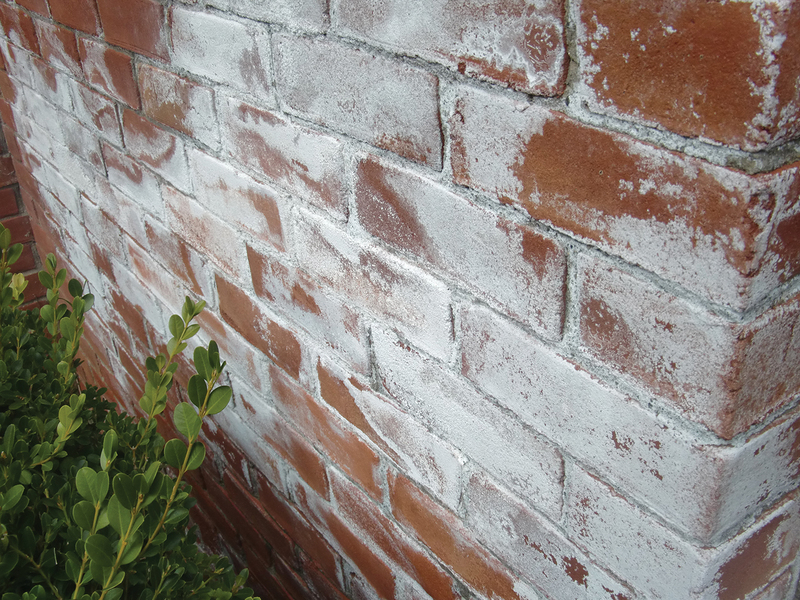 Attempting to seal off efflorescence in brick work is not advisable and it is not recommended to do white wash or rendering the walls before it gets dried off. The soluble salts can be removed by frequent repeated washings with clean water and brushing the face of the masonry. The salts from brickwork can also be removed with a solution of zinc sulphate and water. For this application, the surface that has to be treated should be brushed off thoroughly and allowed to dry. A solution containing 1 part of hydrochloric acid or sulphuric acid with 5 parts of water is applied vigorously with scrubbing brushes and water is being constantly sprayed on the work with a hose to prevent the penetration of acid. By doing so, this helps in removing white or yellow blotches from floors or walls due to efflorescence. Cleaning of external brick walls after completion of the building can be done with a 5 percent solution of muriatic acid. The walls must be thoroughly washed with copious flow of clean water both before and water the application of the solution. The soil used for the preparation of mud mortar, and the water used in the construction should be free from harmful salts. Concrete made of cement, surkhi, sand and brick ballast and mortar of cement, surkhi and sand for laying bricks is suggested to be used for all foundations in effected areas. The surkhi to be made from slightly under-burnt bricks and finely powered, mixed with about 15 to 20 per cent of cement. brick walls, soluble salts, salt neutralizer, damaged brickwork, efflorescence causes, cleaning salt stains, salt stains brick, salt stains masonry, stuff, masonry, home, Salt, brickwork, water, Wall, surface, howstuffworks, works, bricks, repair, damage.